Masakatsu Kondo was born in 1962 Nagoya, Japan. He graduated from the Slade School of Fine Art, and lives and works in London. 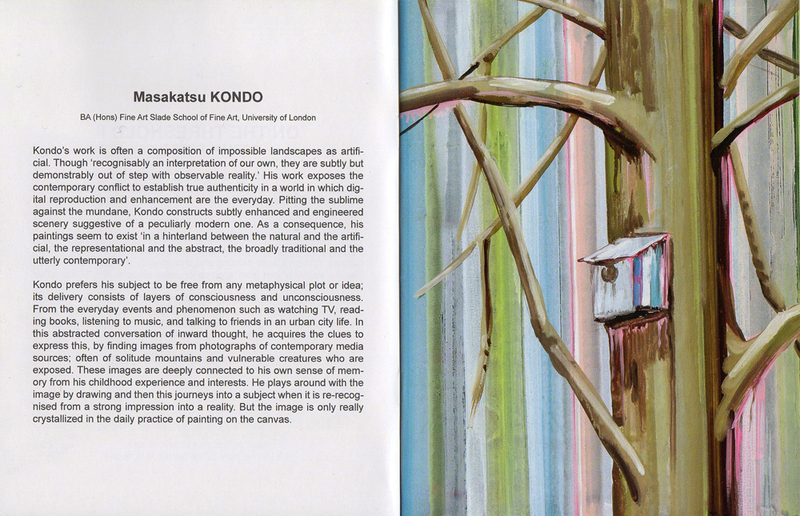 Kondo’s work is often a composition of impossible landscapes as artificial. Though ‘recognisably an interpretation of our own, is subtly but demonstrably out of step with observable reality.’ His work exposes the contemporary conflict to establish true authenticity in a world in which digital reproduction and enhancement are the everyday. Pitting the sublime against the mundane, Kondo constructs subtly enhanced and engineered scenery suggestive of a peculiarly modern. As a consequence, his paintings seem to exist ‘in a hinterland between the natural and the artificial, the representational and the abstract, the broadly traditional and the utterly contemporary’. Kondo prefers his subject to be free from any metaphysical plot or idea; its delivery consists of layers of consciousness and unconsciousness. From the everyday events and phenomenon such as watching TV, reading books, listening to music, and talking to friends in an urban city life. In this abstracted conversation of inward thought, he acquires the clues to express, by finding images from photographs of contemporary media source; often of solitude mountains and vulnerable creatures who are posed. These images are deeply connected to his own sense of memory from his childhood exparience and interests. He plays around the image by drawing and then this journeys into a subject when it is re-recognised from a strong impression into a reality. But really the image is only crystallized in the daily practice of painting on the canvas.